Funny how hearing someone say these two little words often actually invokes the exact opposite response. Instead of trusting, we doubt, we wonder, we hesitate, we revaluate, we worry; but we don’t trust. If we’ve become this type of skeptic, it’s probably because we’ve been hurt and let down by a person who asked us to trust them; and this hurt has left a little broken piece of our heart reluctant to trust again. Repeat this scenario over and over by people in our lives and our ability to trust anyone can become quite damaged. 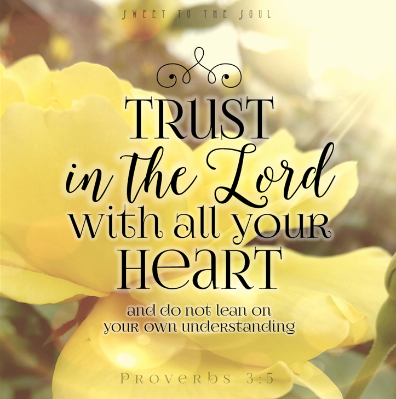 When we are broken and then we read a scripture like Proverbs 3:5, “Trust in the Lord with all your heart” it can seem to sit heavy on the air unable to penetrate the pile of broken pieces of our heart. And we wonder... how do I do that? How do I ‘trust with all my heart’? What does that look like? It can happen just that quick -- This morning I trusted you, tonight, I can never trust you again. And it doesn't take much longer for I don’t trust you to go to I don’t trust me. How did I not know this? How did I not see this? How could I trust me again? There I sat, surrounded by my broken heart and shattered life, filled with more emotions and doubts and questions than I can even now find words for, reaching out and begging God to come fix this broken family - to come fix broken me. ​How Do I Trust With All My Heart? ​It's easy to trust God on the good days, the days when the sun is shining and everything is going our way, the days when everything just seems to fall into place. ​Those are the days when trusting God becomes real. Those are the days when the idea of trust becomes the action of trust. ​Those are the days when we must lean into God and not our own understanding, because He knows and He sees and He feels our pain... and He is at work. ​What Does Trusting With All My Heart Look Like? ​In chapter 3 of the book of Daniel, we learn of three young men who trust in God with all of their heart. ​They were very bold in their trust of God, and the King promptly had them tossed into the furnace. But their God was indeed able to deliver them. We will most likely never face a literal furnace, but when we face the verbal, emotional and physical struggles of life which represent our “fiery furnace” we can be just as bold in facing them as Shadrach, Meshach, and Abednego were, by trusting God - knowing God - IS able to deliver us from whatever ‘people factor’ we may encounter. If you are in this broken place today, know this .... “the Jesus factor is greater than the people factor.” Lean into God, turn trust into action and begin to expect His deliverance and healing. Yes, the sun will come out again, the flames will subside and our God IS able to rescue you and repair your broken heart. Today's blog is part of the #livefree series with Author and Proverbs 31 Ministries Speaker Suzanne Eller. ​If you are finding yourself in a place where you are needing to be rescued and repaired, I would invite you to join Suzie, myself and women from all over for The Mended Heart: God's Healing for Your Broken Places On-line Bible Study hosted by Proverbs 31 Ministries OBS, June 22 - July 31. The study is FREE and you can read more info and sign up by clicking here. "Your past may have shaped you, but it doesn’t have to define you. 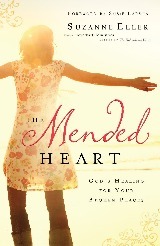 Learn how to move forward and find healing for your deepest hurts in The Mended Heart Online Bible Study." My families’ ordeal brought me to my knees and back to the feet of Jesus. Our relationship was restored and grew into something I had never experienced before. Three years ago God brought a wonderful godly man into my life and called me to serve the Kingdom, that is when “Sweet To The Soul” began. God took the worst thing that happened to my family. He rescued and repaired us, and turned it into a testimony and ministry. Jesus can heal us like no one else. Or any medicine. His healing is complete and whole. I can testify to that! When the IDEA of trust becomes the ACTION of trust! Love it! Thanks, Jana! Your testimony is so moving and inspiring, Jana. Thank you for putting yourself out there and letting God speak through you. You are a blessing to me and others! Whenever I've been broken, the Lord is so near and He gives me just the right scripture to reach into that deep place of woundedness so I can relate to your post. We do have to make that step of trust....but then He meets us and carries us somehow. I'm your neighbor at Testimony Tuesday!